by President Thomas Mengler, J.D., and School of Law Dean Stephen M. Sheppard, J.S.D. The St. Mary’s University School of Law turned 90 years old in 2017. As we celebrate this benchmark and look ahead to our centennial, we are aware of our responsibilities to our alumni, to our students, to the law and to our Catholic and Marianist mission. Thanks to this legacy from our founders, alumni and donors, we will meet these responsibilities for future generations. We both came to St. Mary’s attracted to its mission of forming students as leaders with knowledge, skills and values. We believe in the St. Mary’s commitment to open doors for our students. Today, we ask you to join with other alumni and friends in growing this legacy — a legacy of quality and opportunity in the formation of lawyers committed to the highest ideals of the profession. We believe in this legacy and the mission it supports. As President and as Dean, collectively we bring more than 50 years of teaching and administration in law schools. We know that success for more than 9,000 outstanding St. Mary’s graduates is no guarantee of success for tomorrow’s students. We have an opportunity to lead in this changing world of legal education. To do so — in fact, even to keep up — we must do more for our future students. We must integrate our mission into new curricula for tomorrow’s challenges, leveraging the changing legal education landscape to increase the value of a St. Mary’s law degree. 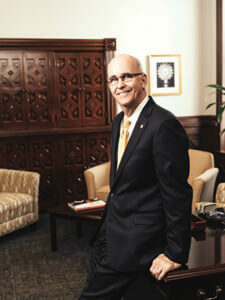 School of Law Dean Stephen M. Sheppard, J.S.D. We must enhance our scholarships to attract and assist students of merit. We must attract great faculty with a commitment to develop tomorrow’s lawyers for tomorrow’s clients. And we must tell our story nationally, to extol our graduates’ achievements and to enhance the value and potential of a St. Mary’s law degree. To sustain these goals, we are launching the law school’s most ambitious campaign to date in partnership with the University’s comprehensive campaign, The Defining Moment. We hope to raise $25 million to sustain the law school. Your engagement with the law school through the campaign and its programs is crucial. We are asking not just for gifts, but also for action. You can help others enjoy the opportunities you received here and enhance the very meaning of your St. Mary’s law degree. Join your fellow alumni and friends. Join the future of the St. Mary’s University School of Law. Essential for St. Mary’s Law is attracting highly capable students who will lead their peers today and our world tomorrow. Many of these future leaders are financially challenged, and competition among law schools for the commitments of these students is at an all-time high. For St. Mary’s to build a successful J.D. class each year, we must offer more scholarships, especially those that provide greater financial support. The Law Success Program is an innovative St. Mary’s program for individual student coaching across the entire class. A synthesis of skills instruction, assessment, retraining and reassessment, the Law Success Program develops both prelegal and legal skills that foster success in class, on the bar exam and in practice. Law Success will not replace traditional study or performance in law school courses. It supports that study and enhances that performance. See this story for more on the new Law Success Program. 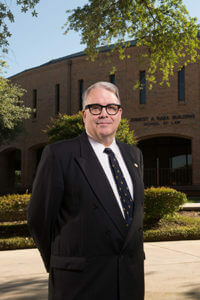 Our faculty members are at the core of a St. Mary’s Law student’s educational experience. During the next decade, St. Mary’s must focus on resources to recruit and retain faculty. Our goal is to raise endowment resources to support our faculty and programs, which will help us attract and retain outstanding resident faculty — our greatest asset. When we support our faculty’s talents, then our students receive the best legal education possible.